It starts with the disappearance of Sutter Cane. A mystery unfolds in our minds as one man, locked up in an insane asylum, starts blabbering on and on about being sorry for balls and lucky shots. Poor John Trent (Sam Neill). But he goes on, claiming not to be insane. He doesn’t deserve the straight jacket. Nor does he deserve to be locked up. And then The Carpenters come through on the PA system. Oh my God. How painful! The torture! Everyone sings along, sending him straight toward a special kind of Hell on earth In The Mouth of Madness, marking the official third entry in Carpenter’s so-called apocalypse trilogy of films. "director John Carpenter nails his ode to H.P. Lovecraft with this horror flick"
It is one hell of a beginning. For about 10 minutes, Carpenter enthralls us with this insane asylum setting. And all Mr. Trent wants is a black crayon with which to mark reality with. What has happened to the world? Indeed! Complete with shadow figures, men with axes, and very sharp teeth, director John Carpenter nails his ode to H.P. Lovecraft with this horror flick. Carpenter loads up with everything: we get a beginning that starts us off in the thick of the moment, a sharp mystery, and enough horror elements to satisfy even the pickiest of moviegoers. The nighttime bicycle scene – the one with playing cards hitting the spokes – is a memorable experience. To this day, it remains a favorite scene as reality itself bends back into itself creating a loop where all things become possible – including the god-like stature of novelist Sutter Cane (Jürgen Prochnow). He’s bigger than Stephen King after all. Arcane Publishing, represented here by Jackson Harglow (Charlton Heston), is in a bit of a bind. They are missing their best horror author and they want the missing manuscript for Cane's final novel. Harglow contacts Trent to track down Cane and assigns Cane's editor, Linda Styles (Julie Carmen), to accompany him on his voyage into the bizarre world of Can’s creation. In the Mouth of Madness is supported by an outstanding guitar-driven score thanks to Carpenter and Jim Lang. Unusual, but damn effective. Something deadly is going on and this soundtrack creates an atmosphere that is both inviting and unsettling. So many twisted things fill the landscape and this music is mood made perfection. 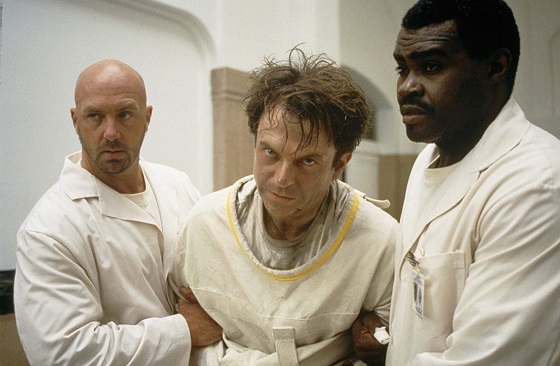 And thanks to a stunning performance from Sam Neill, John Carpenter’s In the Mouth of Madness marks a latter day masterpiece of horror for the director. Unexpected, for sure, but it really is. And to think that he actually passed on the film when it was first presented to him. Here he takes some Lovecraftian themes and paints the sky black with them; everything works. He and writer Michael De Luca discuss the very reality of fiction and argue that sometimes our imagination knows better than what is in front of us. I love this demented tale of madness as reality becomes a playground for one author. Who can forget the sight of Frances Bay kicking the naked old man chained at her feet in the front office of the hotel Trent stays at? Or the cracking faces of the kids in the town that shouldn’t exist? Anyone who dares enter this unholy site is damned forever. Those are the words on the outside of the church at the center of all this madness. And, yes, it still rings true. Age has certainly been kind to Carpenter’s film. This is a forgotten and often overlooked cult classic. But thanks to this 4K transfer, In the Mouth of Madness can now be celebrated properly. The film is now available in a Collector’s Edition from Scream Factory. MPAA Rating: R for images of horror, and for language. Memorable Movie Quote: "I'm sorry about the balls! It was a lucky shot, that's all!" Synopsis: Sutter Cane (Jürgen Prochnow, Dune, The Seventh Sign) is the best-selling author whose newest novel is literally driving readers insane. When he inexplicably vanishes, his publisher (Charlton Heston, Soylent Green, Planet Of The Apes) sends special investigator John Trent (Sam Neill, Daybreakers, Dead Calm) to track him down. Drawn to a town that exists only in Cane's books, Trent crosses the barrier between fact and fiction and enters a terrifying world from which there is no escape. 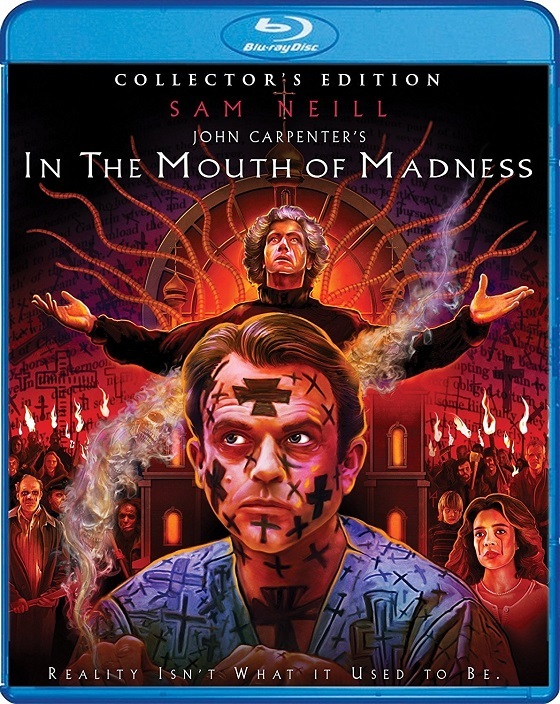 Scream Factory, complete with a new 4K transfer from the original film elements, provides In the Mouth of Madness with a clarity I’ve never seen before. It looks crisp, well-defined, and almost reads like a whole new movie, with better looking effects than remembered. The detail-rich HD transfer is a real stunner. It has dark layers, yes, and those shadows are well-defined and crisp but the new 2.35:1 aspect ratio does not disappoint. Obviously, the film looks better than ever. Crisp contrasts and solid textures lead the charge in this transfer. Colors are solid, with reds being a standout. Blacks are, too. Surprisingly, there's enough fine detail on display to make this seem revelatory. The era-ready color palette looks terrific, too. The disc comes with a new DTS-HD Master Audio 5.1 surround audio. Fans get excellent NEW supplementals with this release. 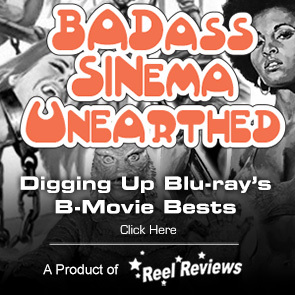 If the 4K scan of the original film elements isn’t enough to entice you to buy and the new commentary from Carpenter isn’t either, then maybe the four NEW supplementals, covering the film’s locations, a new interview with Julie Carmen, new special effects details, and a look at some privately recorded behind the scenes footage will. This is a great release.